Chilly mornings and sunny afternoons will lead the local weather into Friday. Then another cold front returns the chance of showers and ushers in the coldest air so far this fall. Today and Tonight: Wednesday will be the coolest afternoon of the week with highs struggling for the 70 degrees despite ample sunshine. Winds will be a bit lighter, out of the west, northwest at mph. The night will follow with clear skies and lows in the 40s. Up Next: More sunshine is expected for Thursday as high temperatures moderate a bit, getting into the mid 70s. 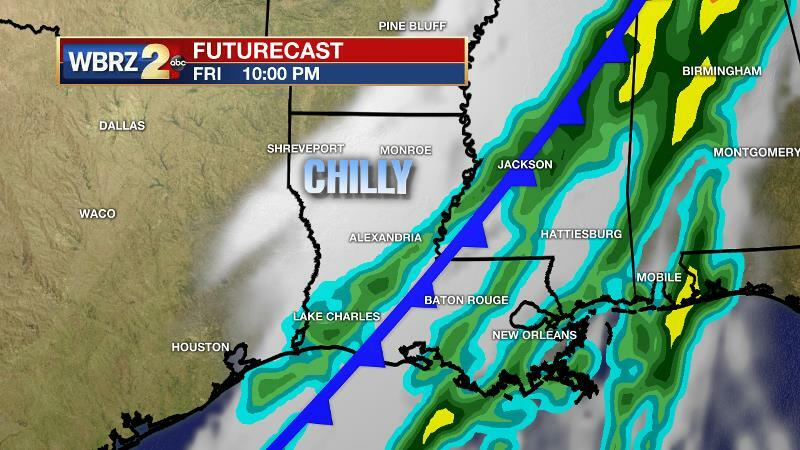 As we approach the weekend, a cold front will push into the area. A few showers and thunderstorms will be possible ahead of the front, possibly beginning as early as Friday afternoon and not lasting beyond Saturday morning. The more significant change with this front will be arrival of the coldest temperatures so far this fall season. Highs will have difficulty reaching the low 60s on Saturday with nighttime lows then dipping into the upper 30s. Some frost is not out of the question. Moderating high temperatures back into the 70s will begin next week. The Tropics: The tropics are all quiet right now. 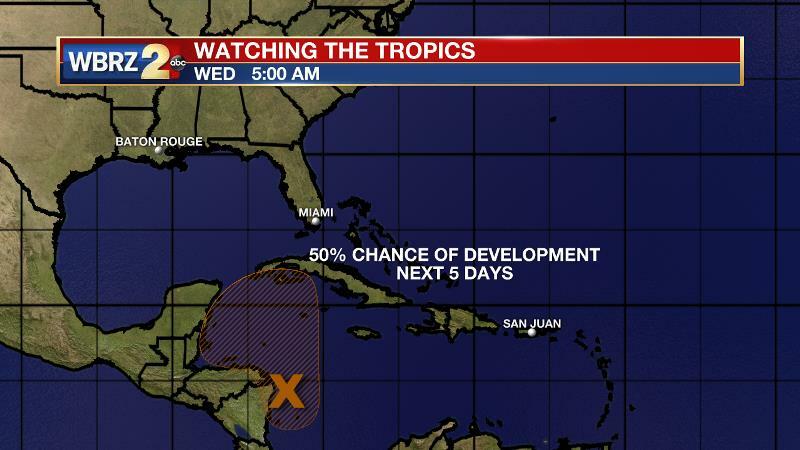 However, by the end of the week, a broad area of low pressure in the southwestern Caribbean Sea has a 50 percent chance of development. We will keep you posted. The cold pool associated with the trough will stay in place through Wednesday with high temperatures struggling to reach 70 degrees. The cool, dry air mass will continue to support mainly clear skies. For the end of the week, expect a ridge to shift east allowing winds to come in off of the Gulf. With the late fall push of moisture a little weaker, another dry day is anticipated Thursday but temperatures will be a bit more mild. With another fairly cool night, but increasing dew points and light winds, some fog could be an issue Thursday night. A deep trough and another cold front will approach the area on Friday. Yet again, models have shifted but this time they agree on timing. Both the GFS and ECMWF are now suggesting an area of showers and thunderstorms out ahead of the front. Precipitation could begin as early as Friday afternoon and last into Saturday morning. Timing will be honed more as we get closer. Now in agreement on timing as well, both models bring the front through early Saturday, which will have a dramatic effect on weekend temperatures. As skies clear, thermometers will be well below average on Saturday afternoon, struggling for the low 60s. Saturday night will be the coldest period with low temperatures in the upper 30s. Another cool and sunny afternoon will follow on Sunday before a slow moderation in temperatures occurs through Halloween. At this time, temperatures are expected to stay at or just below average into the middle of next week. The next chance for rain will not come until beyond that. The WBRZ Weather Team is here for you, on every platform. Your weather updates can be found on News 2, wbrz.com, and the WBRZ WX App. on Apple and Android devices. For new storm advisories as soon as they are issued at 1, 4, 7 and 10 am/pm follow WBRZ Weather on Facebook and Twitter.